One of the benefits of being a working mum is having the day in the office to wear pieces that wouldn't be a wise idea to wear at home with two toddlers. This Hermes silk twilly scarf is dry-clean only so not a good option for a stay at home mum day. Perfect for the office though, where the chances of a grown up smushing their banana into your outfit is a lot lower! I wore this for Melbourne Cup day in the office. It's the 'race that stops Australia' and it means that at some point in the afternoon everyone stops work to watch the horse race. Victorians even have the day off for it! Up in Queensland, we settled for a free lunch, some office sweeps and a little distraction in the middle of the work day. In the past there have been best dressed or best hat competitions in the office, but the celebrations this year were a lot more subdued. Lunch was drastically under catered (luckily I brought my own as a back up) and no prizes or awards. I did get into the spirit and wear my Hermes Twilly scarf as a headband though, a subtle nod to Race Day fashion! Every time I wear scarves in my hair like this I get so many compliments - I felt pretty good about this outfit all day. I was a little late to work that morning because of the twilly though! The day before I'd thought of the twilly and gave it a try, tying it in a perfect bow on my head first go. So of course in the morning rushing to work I assumed it would be just as easy. It wasn't, and I got to work 15 minutes later than normal! Luckily I start 30 minutes early every day. 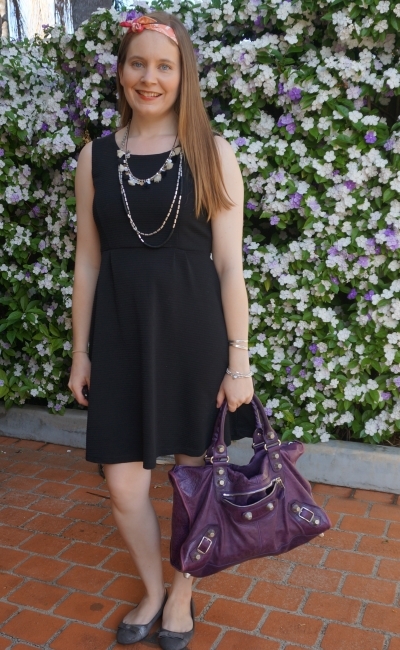 Last worn: Hermes twilly, black fit and flare dress, silver ballet flats, purple Balenciaga work bag. Other ways to wear: Hermes twilly and jeans, black fit and flare dress in winter, silver ballet flats and skinny jeans, purple Balenciaga work bag and blue dress. Perfect for pregnancy: Hermes twilly in second trimester, black dress in second trimester, silver flats and maternity jeans. Another day in the office, another fit and flare dress. Had to get this one out again after loving wearing the black one above. Rather than wearing my twilly scarf in my hair again I wrapped it (a little sloppily) around my wrist. I like wearing my twillies like this, but I so rarely do as it's definitely not a good idea when you're around toddlers - would get much too dirty there. Still was nice to wear it like that for a day in the office. 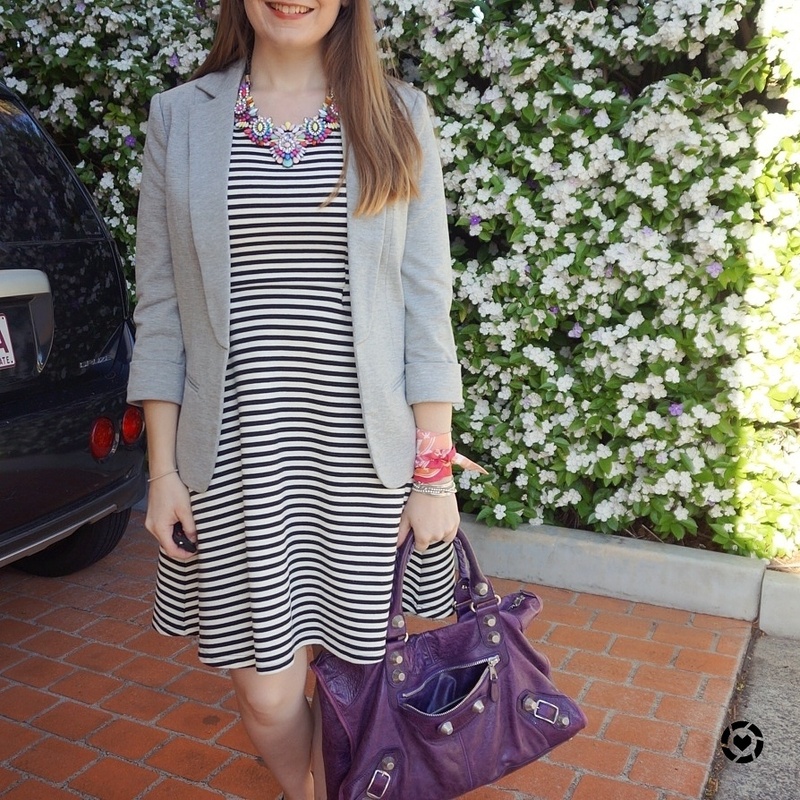 I liked the statement necklace and fit and flare dress outfit combo above, so added this pretty neon statement necklace with the striped dress. I've worn these two pieces together before, it's a combination I really like. Last worn: grey jersey blazer, striped fit and flare dress, Hermes twilly (above), Walnut Melbourne ballet flats, Balenciaga purple work bag (above). 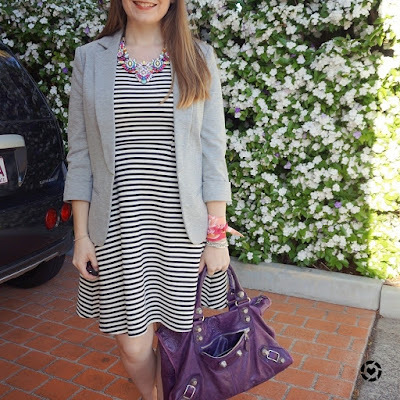 Other ways to wear: grey jersey blazer and floral dress, striped fit and flare dress and denim jacket, Hermes twilly and pink dress, Walnut Melbourne ballet flats and skinny jeans, Balenciaga purple work bag and pencil skirt. Perfect for pregnancy: Hermes twilly and second trimester bump, striped dress in second trimester, ballet flats and second trimester bump. 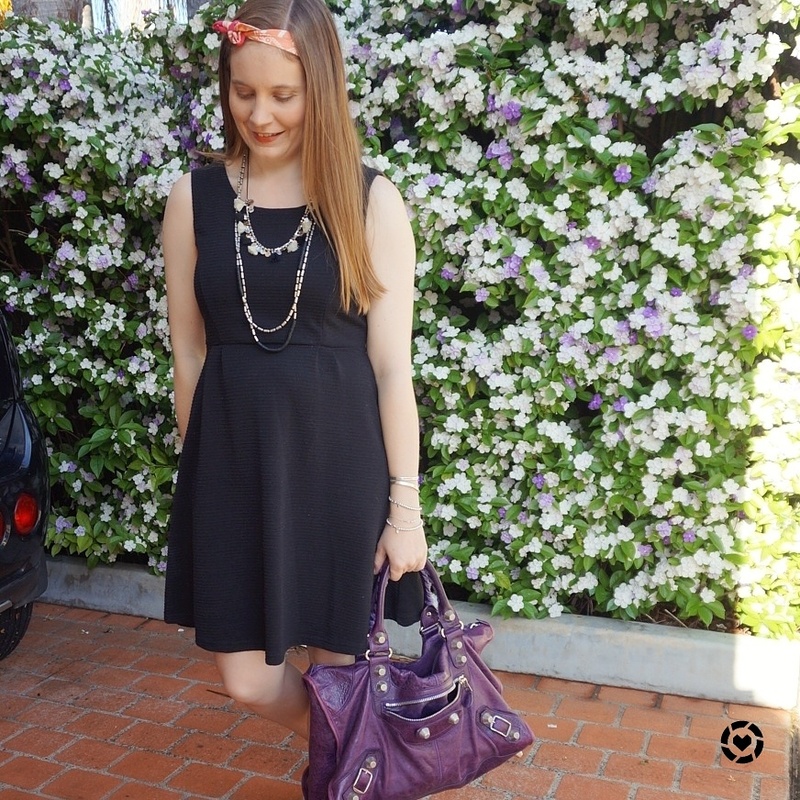 Fit and flare dresses are such an easy option for work, and really don't need much accessorising. It's easy to throw on a statement necklace and go. If you want to add a little extra colour, you can try a brightly coloured bag like this purple Balenciaga work, or wrap a twilly scarf around your head or wrist for a fun pop against a neutral outfit. Linking up with On Trend, Turning Heads, Trend Spin, Confident Twosday, Fashion Frenzy. Love how that twilly can be worn in so many different ways! Also the color looks gorgeous. Love the way you used the scarf! Love all the accessories in this look, the bag is amazing! Like the creativity with the scarf. You look great. I love how you got so creative with this scarf!! These dresses are so cute!! I love it. Happy new week Mica! Great portraits! The scarf adds a super stylish touch to both looks beautifully!! The weather looks awesome there! It was very hot this weekend and this week week is starting off chilly:) Either way I am grateful for another beautiful day! Have a blessed week! Oh yes, definitely need to consider pets too! Loved your dress for the "race watching" at the office! Sad that the lunch was subdued this time, but it's a sign of the world now - but anyway, why not, we tend to eat more than we need :) And joy is what counts! I loved your dress and headpiece ad the bag is amazing! Loved the striped outfit as well! You look very beautiful! Hope you have a lovely week! I didn't know anything about Cup day. Sounds fun and your scarf looks cute tied on your head. I like both dresses! Perfect for work. I absolutely love the twilly as a headband. It looks so lovely on you. That's such a cute idea to wear the scarf as a hair band and a bracelet! You are so creative. I have winter scarves but never thin ones like this because I have no idea how to wear it. Love how it looks as a head band though. This is so true, I know what you mean! The office is the perfect place for wearing outfits which are impossible with two toddlers! Love your wonderful 1st look including the fantastic hairband - it definitely was worth that it took you more time than expected. And also the 2nd outfit is really good and suits you absolutely well. I wore a scarf around my neck a couple times, but I like the headband idea too! Racing day sounds like such a fun event! An Hermes silk scarf is such a classic wardrobe accessory and the styling possibilities can be quite versatile as you're showing here. I've seen them worn as headbands before but I love how you're wearing yours's as a bracelet. It looks so pretty. haha yep, dry clean only fabric is never good near kids! You look great in both outfits: I really need to learn how to tie these scarves. That bag is so beautiful! 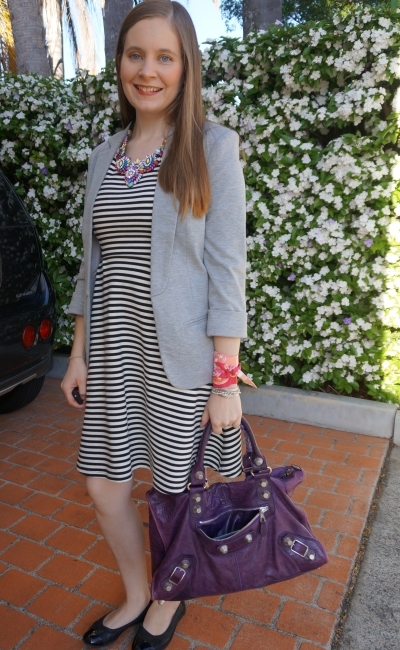 Love the two different ways you styled this scarf -- super cute looks on you!! Scarves are such a fun accessory! Your comment about grown-ups not smushing their banana onto your outfit made me laugh. I definitely feel the same way about getting dressed for the office--it's nice to have a place to wear the stuff I know I'd ruin at home! I love the scarf in your hair, but I'm sorry it made you late!! The scarf in your hair really suits you, I can imagine you get a lot of compliments on that. So much! I think it's the colour, looks good with my eyes! I love that you wore this as a headband! You look adorable in both outfits. That black and white striped dress is seriously fabulous! I love the scarf as headband - it looks so pretty on you, Mica. And wearing it on your wrist is such a good idea. By the way, if your scarf is silk, you can hand wash it in cold water with a small squirt of shampoo, rinse with cold, then block it flat on a towel dry naturally. Iron it, and it will be perfect, good as new. Unless you sweat on it or get it really dirty, though, you shouldn't need to wash it, just air it out after wearing (unfold it, lay it somewhere out of direct light). Thanks so much Sheila! I'll need to give that a try as I have a few silk pieces I'm too scared to wash! I never get creative with tying my scarves, but I must try it as a bracelet! And I totally get being late trying to get it tied perfectly. Drives you nuts! haha yes, I was getting so frustrated with myself! Oh those scarves are definitely NOT kid friendly! But they are sooooo beautiful - what a great investment. I love how you've wrapped it around your wrist - most definitely an office-only accessory!! I think it would look fab around the neck too - of course too hot right now - the colours look great against your skin! haha that is true! Even when I'm kid-free my outfit has to stand up to my clumsiness! Beautiful looks! I love both ways you have accessorized your scarf! you look great in both styles! And such a great idea to match the scarf with your ootd! I LOVE the scarf used as a head band- it looks so cute on you! You look so pretty in these outfits, loved the black dress on you. WHat a great idea is to use the scarf as a headband, looks amazing on you Mica. Wish you a wonderful week ahead. I had to laugh at your banana comment, but isn't that the truth?! That scarf is so pretty and I love both ways you wore it. I have scarves I wear as a headband occasionally, but I haven't tried them as a bracelet and I need to! It's adorable! And why is it that whenever we are in a rush everything seems to take longer even tying a bow? I know the feeling! But I love how it looks as a headband on you so I am glad you didn't give up! Thank you! It's true, things never work out when we are stressing and rushing! Very pretty Mica ! Both wearings of the twilly rock. haha it really is! Such a perk to being back at work! I love a fit and flare dress and that black one is especially lovely. You sure know how to rock that twilly in your hair - great look for Melbourne Cup! Hope you got lucky in the sweepstake! Sadly not! Once again I drew the favourite and got nowhere near! You look so pretty with the longer hair, Mica! Almost didn't recognize you with the headband! I love little black dresses! The purse is cute too! I love how you styled your twilly, it adds such a lovely pop of color to your outfit, and I can see it being the perfect accessory for an otherwise monochromatic outfit. Usually I only see twilly on bag handles (that's what I use mine for 🙈), but I'll have to try it as a bracelet one day! Mica, that Hermes scarf is the perfect accessory. Love it in your hair and around your wrist. So pretty! Also love that black dress. Mica I think this is really creative wearing it as a headband and as a bracelet! I love the Hermes scarves as their prints are so pretty! I have always wanted one to wrap around my Celine handle!